Grate peel of orange and lemon. Place in 3-quart glass or non- corrosive casserole with cover. Squeeze juice from orange and lemon; add to grated peel in casserole. Add apples, butter, cinnamon and nutmeg. Toss to combine. Cover with casserole lid. Bake in preheated 350F oven 1-1/2 hours. Remove from oven and let stand covered 30 minutes. Carefully remove lid. Stir to break up apples. Stir in Equal®. Serve warm or refrigerate, covered, several hours before serving. 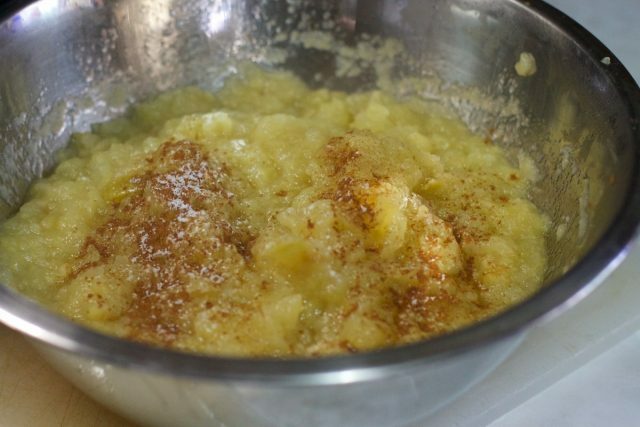 A unique applesauce that bakes in your oven. Citrus flavors enhance the 2 different apple varieties used. Delicious enough to serve as a healthy dessert.